Dear Diva, I’m trying to figure out what type of window treatments for a home office. Problem is there are a lot of variables to consider and I want to make sure that I choose wisely. The office is on the second story and gets a lot of sun light and heat during the summer which I want to block out. But during the cooler times of the year I like to let the natural light in. I also might want to make this room a guest bedroom in the future. Do you have any suggestions? Option #1: Top down/bottom up cellular shades. The top down/bottom up feature will allow you to maintain some light blocking and privacy, while still allowing some light to come in from the top of the shade. This feature is also excellent if you have an unsightly view or if you want to maintain your privacy and let light in at the same time. The top down/bottom up option can be added to most custom cellular shades for an additional cost. 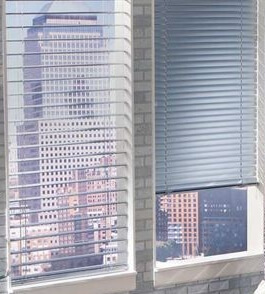 You also may be able to choose from a corded or cordless style depending on the size of your window. I prefer the cordless option because it has less strings hanging off the shade, but keep in mind that you will need to be able to reach the shade to raise and lower it. 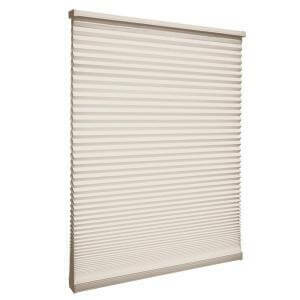 Cordless blinds are never good for windows that are harder to get to or require a stool to touch the top of the frame. Also keep in mind that it is quite a bit more for cordless top drop/down bottom up. For corded top down/bottom up expect to pay around $25-45 per blind. For cordless the price could be anywhere from $70-100 per blind. Option#2: Day/night cellular shades. This feature is really two shades put together into one. You get a light filtering fabric on the top and a room darkening fabric on the bottom. It will allow you to have the best of both worlds. If you want to let more light in but still maintain a little privacy, lower the light filtering fabric. When you are ready to block out all the sun or heat, raise the room darkening fabric. You get both fabrics and the normal functionality of a regular shade. The day/night option is great because it gives you both a room darkening fabric and a light filtering one. But it does come at a significant cost. This option is priced as two separate blinds, so it doesn’t come cheap. And it because it is two different fabric types even when one blind is closed all the way and you are utilizing the other one, you will be able to tell that it is two shades in one because of the fabric difference and it has an extra rail in the middle. Personally I don’t think that is a big deal, but it has been known to bother some people so it is worth mentioning. Out of the two options mentioned above. I chose a top down/bottom up cordless cellular shade. Because I wanted the streamed line cordless look I have in other rooms of the house and the day/night option was only available with cords. If being cordless is important for you, consider the top down/bottom up. Otherwise the day/night is also a good choice, since both of these options take into account the other variables you are considering. And no matter which option you choose I am confident that both will allow you to enjoy your window treatment for years to come, no matter if that room stays your home office or becomes a guest room!